Telenor Pakistan has announced its new value added service for its Djuice subscribers which helps Djuice users to prepare for exams via text messaging. 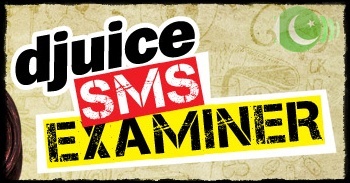 This newely launched service is named as Djuice SMS Examiner. A very useful learning service. The SMS Examiner Service is part of djuice E- Learning Portal initiative. This sms based application allows users/students to go through objective type examination questions from approved text/course books. It also enables the users to go through the last five years of actual National and Provincial Board/University examination papers. This service will also provides date sheets and result dates via SMS. Customers can subscribe to this service by sending SUB to short code 5678 or by dialing *345*5678#. Once subscribed, customers can sms EXAM to short code 5678 to start the Examination. Subscription Charge: PKR 10 + Tax per week. This service is little bit expensive, because exam preparation needs too much Questions and Answers, but a very useful service for students.